This page will help you get to know your Xbox One console a little better. 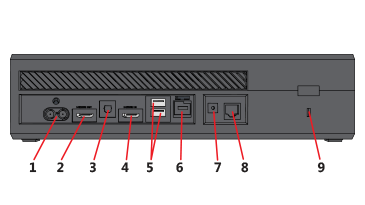 The following illustrations show you the important buttons and ports that you'll be using. USB 3.0 port: Used to connect wired accessories, such as the Xbox One Play & Charge Kit. Eject button: Used to eject a disc from the console. Discs will insert automatically. Xbox button: The console's power button and LED indicator. Accessory pairing button: Used to connect wireless accessories, such as the Xbox One Wireless Controller. Infrared receiver and blaster: Used to receive signals from the Xbox One Remote or to send IR signals to devices to be controlled through OneGuide. Eject hole: Used in the rare event that a disc gets stuck inside the console. See Manually eject a disc from your Xbox One S or original Xbox One console. Power port: Power supply connects here. HDMI out: HDMI cable connects here and then to your TV. HDMI in: HDMI cable connects here and then to your HDMI-compatible cable/satellite receiver. USB 3.0 port: Used to connect wired accessories. 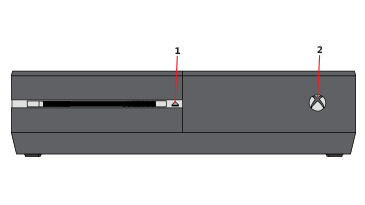 If connecting a Kinect Adapter, use this USB port on the left as you view the rear of the console. USB 3.0 port: Used to connect wired accessories. IR out: Infrared output port for IR blaster (optional; IR blaster not included). S/PDIF: Optical audio output (optional; optical cable not included). Networking port: Ethernet cable connects here from your modem or router (Ethernet cable not included). Lock port: Allows you to connect a laptop lock to your console to secure it (optional; lock not included). Xbox button: The console power button and LED indicator. Eject hole: Used in the rare event a disc gets stuck inside the console. See Manually eject a disc from your Xbox One S or original Xbox One console. Accessory pairing button: Used to connect wireless accessories such as the Xbox One Wireless Controller. Power supply port: Power supply connects here. 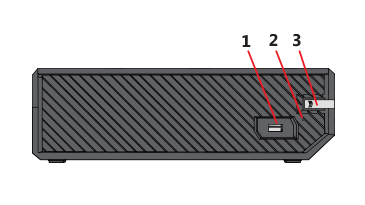 USB 3.0 ports: Two ports used to connect wired accessories, such as the Xbox One Play & Charge Kit and gaming accessories. Kinect port: Proprietary USB port, to be used only for Kinect. IR out: Infrared output port for IR blasters (optional; IR blaster not included). Would you like to contact Support regarding the "Get to know your Xbox One S or original Xbox One console" issue you were reading about or a different issue?